Real Estate Scorecard is often asked “where can we retire in Florida that’s not so hot and humid?” This year, they found the place and it’s located about 20 miles east of the Gulf of Mexico built high up on the Central Ridge. The Villages of Citrus Hills is a benchmark in master planned communities according to Real Estate Scorecard. They applaud developer Sam Tamposi Sr and Gerald Nash for their insight long before the retirement wave got under full swing. Knowing how much retirees enjoy golf, tennis and wellness amenities, the developers took their time and built a 6,000 acre community that retirees can afford in harmony with the market’s demand for housing and amenities. With over $120 million in infrastructure built to date, amazingly the community is still debt free. The newest of the amenities are quite extraordinary. The 45,000 BellaVista Spa & Fitness Center is one of the finest Real Estate Scorecard has seen in the Southeast. If one hadn’t considered working out on a regular basis, having access to this first class amenity could be a turning point in improving one’s health. The center is inspiring and has a wide diversity of cardio and weight training equipment placed in a spacious, bright and cheery room. Adjacent workout rooms include an aerobics studio, indoor racquet balls courts, steam rooms, saunas and a full service spa. The center also houses an indoor swimming pool and jacuzzi. The list of fitness and wellness classes is extensive and of course, personal trainers are available. The building is built in a square framing out an open air courtyard with a massive fountain as the focal piece. Off to one side is an outdoor massive labyrinth for meditation. The community has two additional fitness facilities so there’s never a need to wait to use the fitness equipment. Rockwood Park is the community's largest park and has an outdoor fitness course, bocce balls courts, a hiking and biking trail and dog park. Citrus Hills Central Activity Center is equally as impressive and is where residents enjoy frequent broadway-like entertainment for a minimal cost. Tennis enthusiasts can join the tennis club and access to 8 Har-Tru tennis courts or use one of the four new pickleball courts. The Villages at Citrus Hills is also home to three championship golf courses and three clubhouses offering casual and fine dining. The Skyview clubhouse is grandiose with elevated views of the golf course. 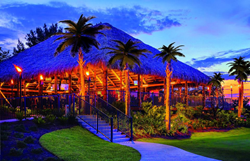 The outdoor Tiki Bar/Grill is another hub of the community is a massive structure themed after the Polynesian islands. The topography is quiet fascinating at the villages. It is blessed by a combination of rolling hills and high elevations showcasing beautiful vistas and colorful sunsets. Elevations reach 260 feet above sea level which is rare in Florida. This contributes to what locals call “the comfort zone” where temperatures year round are mild and pleasant. The average annual temperature is 72 degrees with 65 percent humidity. Pure bliss for most according to Real Estate Scorecard. With approximately 50 percent of the region surrounded by protected state parks and nature preserves, residents won’t have to deal with a densely populated city 10 years down the road. The rural area has a relaxed feeling yet has modern conveniences a big-city transplant would hope for. For example, a new Publix, Walgreens and SunTrust are situated directly across the street from the main entrance. Charming small towns surrounding the villages include Crystal River, Inverness and Spring Hill. Brand label shopping can be found in Ocala Florida about 30 minutes away. Just a little bit further, residents have access to collegiate and national sports in Gainesville or Tampa. Orlando is about an hour east. What they appreciate about the village’s location is the uncrowded highway corridors making it easy to reach the larger cities when needed. Where’s the beach one may ask? Cedar Key is the hot spot and is a stress free ride about an hour northwest of the village. Retirees have the choice of buying new homes, maintenance free homes or re-sales starting from the mid $300's. The gated community is not a cookie-cutter neighborhood. Buyers will find a variety of home styles with plenty of elbow room. A social club membership is required and affordable at around $288 a month included POA fees. A social club membership comes with full access to the Meadows golf course and discounted rates for the Oaks and Skyview golf courses. When researchers on Real Estate Scorecard's team say “I could move here tomorrow”, they know they’ve found a winner. The Villages of Citrus Hills is honored with the 2017 Bliss Award for Best Florida Community of the Year. If folks would like more information about Citrus Hills, new homes in Ocala FL or would like Discovery Package information to explore the villages new homes, write info(at)realestatescorecard.com.